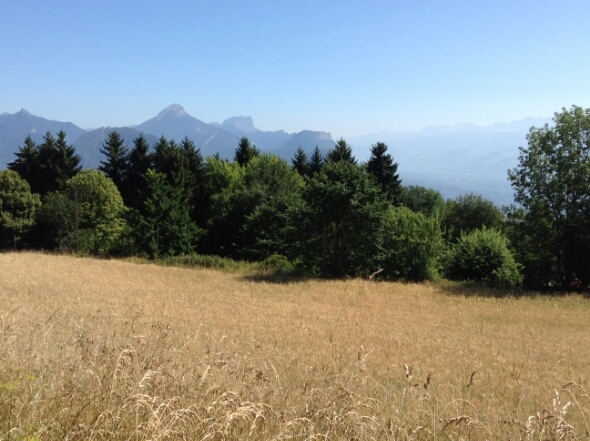 You are here: Home / Blog / Eugene rides Europe / Down to Grenoble ends on a high note!!! Down to Grenoble ends on a high note!!! As I said in the previous blog we climb to Villard de Salans then you climb another 10 km and way below you in the valley is Grenoble. 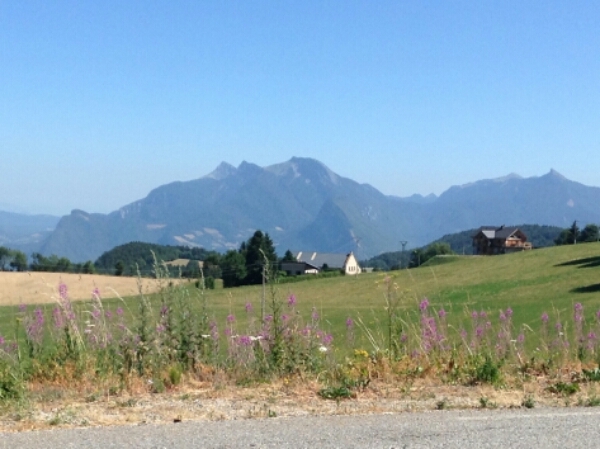 This is a pic of the distant Alpine mountains beyond Grenoble with Alpe Du Huez and the other famous cols yet to be ridden on “Big Orange”. The looks we get when these slick roadies pass you or try to on some of the climbs is worth a million dollars. Normally they shake their heads in disbelief and you get a ” chapeau” in admiration I hope!! Coming down into Grenoble again highlighted the speeds the pro riders achieve coming down at 100 plus kmh and how frightening it is. We did not match their speed but certainly flew down with the weight pushing you even faster. It was like descending into a cauldron with the temperature in the high 30’s from a cool mountain top temperature. We did the sensible thing and collected our prepaid train ticket back to Paris for Saturday evening and found the closest café to hide from the heat. I chose the China Moon opposite the Gare and had an Asian meal with a Belgian beer and perspired freely for three hours. It was a good opportunity to charge batteries and catch up on messages as well as Skype. By 4.30 I decided to leave and head for Alpe Du Huez. Now the temperature was still 36 degrees but riding help create a breeze that made it a little cooler. As we were exiting Grenoble we could see a thunderstorm directly ahead and realised we were going to be wet very soon. I spot a bunch of MTN Quebeka shirts and promptly stop. It is Mark Beneke, Martin Saunders and a few more guys whose names escape me for the moment. They have just ridden Du Huez as it is a rest day for the tour. Now I have been on the lookout for Garra and Mark since the start of the TdF in Utrecht. But I also did not want to be a pain in the derrier because they had a job to do. A quick photo session and a lot of chatter and they headed back to Grenoble and we headed on in the direction of the storm – well towards Alpe Du Huez. Now that’s a nice high to end the day on not forgetting the thunderstorm which by now had hit us head on …………!!! https://i1.wp.com/www.cycleworx.co.za/wp-content/uploads/2015/07/wpid-wp-1437559247991.jpeg?fit=600%2C448&ssl=1 448 600 Eugene Roux https://www.cycleworx.co.za/wp-content/uploads/2018/10/sycleworx_logo_name-340x82.png Eugene Roux2015-07-22 10:03:122016-01-14 07:32:24Down to Grenoble ends on a high note!! !